Activities to last all throughout the Winter period, this collection of Godly play ideas will keep kids occupied in the cold and wet winter days. This new series invites children in preschool through to 6th grade to enter into our sacred stories. Based on the Montesorri method, Godly Plays uses a careful telling of scripture stories, engaging story figures and a variety of creative activities to encourage children to seek and find their own answers to their faith questions. This unique approach to religious education invites children to wonder about themselves, God and the world in a way that is playful and meaningful to them. Godly Play respects the innate spirituality of children and encourages them to use their curiosity and imagination to experience the mystery and joy of God. Godly Play sessions can be adapted to fit meeting times from 45 minutes to two hours. Each lesson plan includes the story and a complete materials list. This volume contains ideas for 20 presentations, including Advent, Christmas, Epiphany and several of Jesus' parables. Volume 3 (Winter) sessions includes 12 presentations based on stories about the Advent season and the feasts of Christmas and Epiphany, followed by the parables. The Complete Guide to Godly Play by Berryman was published by Continuum in January 2002 and is our 14160th best seller. 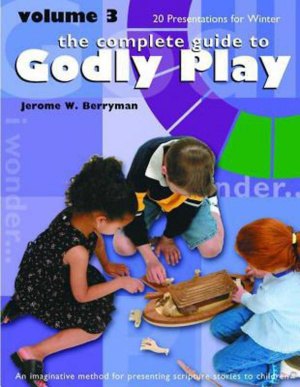 The ISBN for The Complete Guide to Godly Play is 9781889108971. Be the first to review The Complete Guide to Godly Play! Got a question? No problem! Just click here to ask us about The Complete Guide to Godly Play.